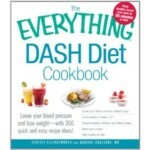 My goal on The Daily Dish is to make healthy, low sodium food taste GREAT. But equally important is sharing recipes that are easily replicated at home. As a wife, mother and chronic sufferer of Meniere’s Disease, I have little patience, time & money for complicated and expensive creations. Simple dishes are KEY to staying on track with a salt-free diet. And I aim to put as few barriers as possible between myself, my readers and their health. A week ago, I posted a fabulous recipe for the simplest of dishes, a “faux” quiche that substitutes extra firm tofu for eggs, to amazing results. That recipe came courtesy of a new acquaintance, The Happy Herbivore, known to friends and family as Lindsay. She and I share a love of simplicity and accessibility when it comes to cooking, and like us, she understands the difficulty of maintaining a “special diet” – though hers is vegan. Friends, today I have a VERY special treat to share! Because Lindsay has most generously allowed me to post her recipe for FAT FREE Cornbread – to be published in her upcoming (still unnamed) second cookbook. 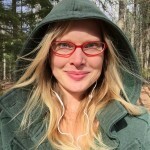 Lindsay’s first cookbook, The Happy Herbivore (released in February 2011) has already completely sold out on Amazon.com and is in back order for a second printing. It truly is THAT GOOD! Lindsay’s recipe for fat free cornbread couldn’t be more straight forward. Just a handful of ingredients, one mixing bowl, a whisk, pan and oven are all that you need. This recipe contains no eggs, no dairy, and no oil. If you’re scratching your head wondering whether a tasty cornbread is possible without any of the above, let me reassure you. YES. And because of the omission of salt and eggs, this cornbread has just under 9 mg sodium per serving. Truly spectacular! But as good as the health benefit is its taste. This cornbread is hefty, with a remarkable crumb. Its subtle sweetness is derived from a smidgen of sugar and pure maple syrup — the star of yesterday’s show. I prefer vanilla soy milk, but you could readily use any non-dairy “milk” beverage, whether rice or almond, plain or not. I actually made two batches of this yesterday and both are almost gone! Thanks so much, Lindsay, for sharing!! Wishing The Happy Herbivore much well-deserved success!! Preheat oven to 400 degrees. Lightly oil a 9-inch square baking pan and set aside. In a large mixing bowl, whisk together the cornmeal, flour, sugar and baking powder. Add the soy milk, applesauce and maple syrup and whisk to combine. Pour batter into the prepared pan. Place pan on middle rack in oven and bake 20 minutes. Remove from oven and place on wire rack to cool. Cool briefly before cutting into squares and serving. Serve warm or at room temperature. This entry was posted in Bread and tagged Happy Herbivore, Lindsay Nixon. Bookmark the permalink. this cornbread is actually in my first cookbook—but I added two variations to in in the new (still unnamed) book… this cornbread is one of my fave recipes. Thanks for blogging about it!! I made this cornbread last night and followed the recipe, but mine turned out flat and heavy . . . nothing like the picture! It did taste good, but it was not pretty! I used whole wheat flour (no baking soda) and yellow corn meal. Suggestions? 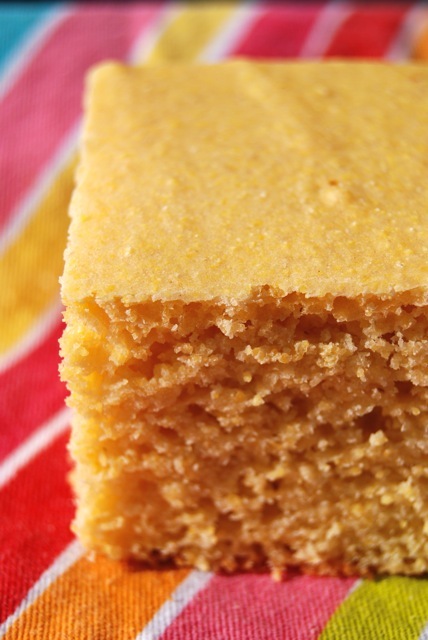 The lack of baking soda likely lead to the flatness and heaviness of your cornbread. Try it again with baking soda and see if that fixes it. I just made these, with some changes. I did not use any baking powder. I used 1 tsp of baking soda instead. I used cashew milk instead of soy milk, mashed banana instead of apple sauce and oat flour instead of the regular flour. I further omitted the sugar. Now that’s quite a few changes! However, these turned out amazing! My kids devoured them and immediately begged for more! The whole house was perfumed with the warm scent of delightful corn baking and the muffins themselves (I baked mine in a 12 muffin tin) turned out soft and moist on the inside and firm to touch on the outside.. Baking is funny and sometimes things work out fine and other times not so fine. Maybe try this recipe again? Good luck. Oh … and I forgot to mention that I added 1 Tbsp of apple cider vinegar. I normally baking with baking soda coupled with 1 Tbsp of apple cider vinegar. I pour the vinegar into the milk and let that sit for 5 minutes before using it in the recipe. I find it has sort of a buttermilk affect on the baking. Things will rise and be light and fluffy without the use of baking powder. Good luck! My pleasure!! And thanks for the note; cornbread in books #1 AND 2! Can’t wait to get my hands on them BOTH!! So many wonderful recipes to try.. WOOHOO! While I’m off track… have I commented on how amazing your photographs are?! I know everything you post here must taste wonderful, but it also LOOKS that way… which is no small feat! AND while I’m still off topic… I usually get whisks taken away from me. I tend to play with (and eventually break) such things. It’s a problem. I’m worse than Letterman when he has a chef on. Inky – you are far too kind. Thanks! I think it’s easier to take pictures of things you love – hence my predilection for photographing food & my family. Also, our home, pets, and trees. And the sky. I like that too. And … hahah — I just like taking photos, I guess. But I like eating even more! What a weird recipe! Looks delicious, though, especially thanks to your fiiiiine picture-takin’ skills. And I really need that with the kale/chicken thigh/lentils skillet thing I’m making tomorrow night. You’ve finally inspired me to cook! Hope your meal is AMAZING!! 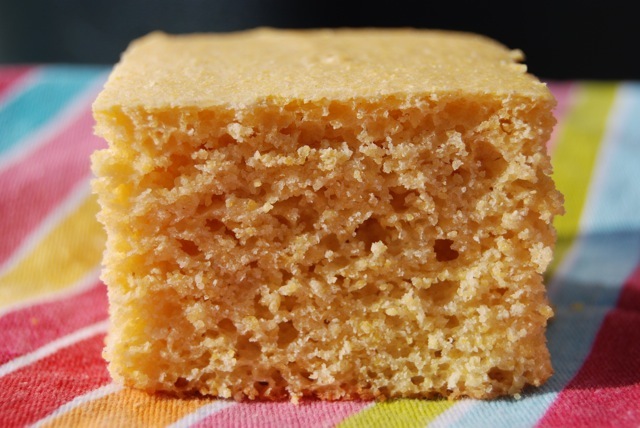 I would like to make this cornbread, but I need to know what type of cornmeal and flour should I use ? and if pure maple syrup is unavailble will pure honey or molasses work as a sub ? I used all-purpose flour and standard medium cornmeal. I think honey could be used (molasses would be too dark) but it might affect the rise. I use gluten free oatmeal that I make into flour in my food processor. Great recipe and the family will enjoy it again tonight with Happy Herbivore type chili. Thank you, Lindsay. Hi Elly, that’s a wonderful tip! And so much cheaper than buying a prepackaged gluten free flour blend. Thanks for sharing! LOVED this recipe. I made it with chili and it was a BIG hit. I too ground up some gluten free oats for the flour. I used unsweetened vanilla almond milk in place of the soymilk and I left out the 2 T of sugar. AWESOME recipe. Love the Happy herbivore! I love Lindsay and the Happy Herbivore too! She & her recipes ROCK! I have not found any soy milk that is fat free. What brand do you use? Hi Karen! 8th Continent makes a great fat free soy milk. Hello, this recipe sounds really good especially since I am always looking for low fat/fat free recipes. One question though, do I use sugarfree applesauce in this? Thank you. Hi Gabi! You just use regular unsweetened applesauce (typically labeled natural or something like that). Hope this helps! I made this cornbread a few weeks ago and my boyfriend and I LOVED it. So, thanks! I’m wondering what you think about using the recipe for muffins and maybe adding blackberries, blueberries or raspberries to the batter? 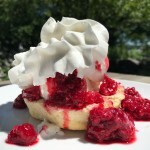 I thought it might work, plus make the batter even more moist…and the sweetness of the berries sounds good against the not-too-sweetness of the cornbread, yeah? Your thoughts? Thank you! Thank you! For posting this recipe! It is in my favorite cookbook, Lindsay’s first cookbook, which is among the missing right when I need it most. (I will find it when I clean up after Thanksgriving.) I use this cornbread, along with whole wheat bread, to make the best vegan dressing, a.k.a. Stuffing. This is the easiest and best cornbread ever. Thank you again! Back to cooking……..
Hah! You’re so welcome, Amy! Hope you had a marvelous Thanksgiving! I just made these. I read some of the comments and adapted. I used gf oat flour (oats ground in my Vitamix), organic Arrowhead Mills cornmeal (it’s a finely ground cornmeal), and added 1 t. of vanilla because I used original almond milk, not vanilla. I made muffins and took them out after 15 min. Next time I may decrease the time. They weren’t burned, just well done. Love this recipe and can’t wait to make them again!! Sounds delicious, Faye! Thanks for sharing!! This was excellent! I used a ripe banana instead of applesauce just to use it up. The consistency & taste was fantastic with rice & beans! The kiddo had with a little smear of vegan butter & honey. I haven’t tried this recipe yet but I am going to asap! Im really excited about it.. my only question is does anyone know what I can use to replace oil entirely? Even for just the pan.. is there anything else I can use besides oils and butter to make a pan non-stick? One thing you could try is simply parchment paper – line the pan with it, maybe even try greasing the pan, then sticking the parchment to it, so it’ll stay in place. Good luck to you! Just made this for the first time. I won’t be the last! Delicious! Doubled the recipe and made it in my huge cast iron skillet. Served it with a vegan chili – that I made up. Hubby just said it was one of the best meals he has ever had. Awesome, Keri! So great to hear. I made this recipe as muffins and they were perfect! I made 9 muffins and wassurprised by how much they rose. They are delicious! I made this as directed but added frozen sweet corn kernels. I’m happy I added those, because without them it would have been very dense and bland. I will try making this again, keeping the corn and probably adding even more, and then upping the corn meal and minimizing the flour. Not sure what happened, but it was a little disappointing. Hi Karin, Great idea to add the corn. Sorry you weren’t thrilled w the recipe as written by Lindsay. Hopefully with a little tweaking you can make it your own – and one you’ll really enjoy. Eating on the Starch Solution program. Made a big pot of pinto beans in the crockpot. Mixed up the cornbread as written using original soy milk. Then heated up the griddle and made griddle cakes to eat with the beans! Delicious! Husband said why make regular pancakes when these will do! Think I will add blueberries and have them for breakfast! Easy and simple. Love the no oil and dairy. Thanks for sharing it! The first time I made this, it was WAY too sweet and did not rise at all. I also made it gluten-free with oat flour replacing the wheat flour. Today, for my GF/DF kiddos (and self) I made this again, but instead of adding the sugar, and maple syrup, I used 1/2 cup of applesauce. I added a pinch of salt (no issues with sodium) and it was much lighter, and not nearly as sweet. Still GF/DF/Oil Free, but with much less sugar. Yum! Did you use 1/2 applesauce in addition to the 1/4, or did you use 1/2 in all? Do you have to mix the liquids together separately before combining to the dry batter ? Hi K! No, you don’t- just add to the dry and combine. Enjoy! I made these today for my husband who loves corn bread but hasn’t had it since he went vegan 9 years ago. He LOVED it! I made his favorite pea soup and served it with this corn bread and he said it was like eating cake, which was great because it was his birthday. I looked at a lot of recipes online before finding this one which was exactly what I was looking for: super simple, no oil or “butter” and clean ingredients. I used almond milk instead of soy, ground up oats instead of wheat flour (just whirled’em up in the coffee grinder until they became a fine flour) and I didn’t have the sodium free baking flour so I used an aluminum free brand with sodium and they still turned out amazing! I will have to get the sodium free brand you mentioned for future use. Thank you so much for this wonderful recipe which made my husband’s birthday extra enjoyable. I will definitely make these for him again. I made this with the low sodium lean baby back ribs, steamed broccoli and roasted potatoes. Delicious cornbread! YUM. Great to hear, Chris! Is there any replacement for the applesauce or banana? I’m a southern girl and don’t like even a hint of sweetness in my cornbread. I definitely delete all other sweeteners in this. Just need another replacement for the oil. Maybe you could try a nonfat plain yogurt instead? Not sure if that would add sweetness or not but you could try!